ROBOTC.net forums :: View topic - Edit robot already made ? Edit robot already made ? Post subject: Edit robot already made ? I don't know if there is already a topic about that but I want to know if it is possible to edit robots which are already made or at least change the sensors. Post subject: Re: Edit robot already made ? There is no way to edit the robots inside the Virtual World. When using RVW with ROBOTC, you must match the Motor and Sensor Configurations in ROBOTC to the robot that you are trying to use in the Virtual world. 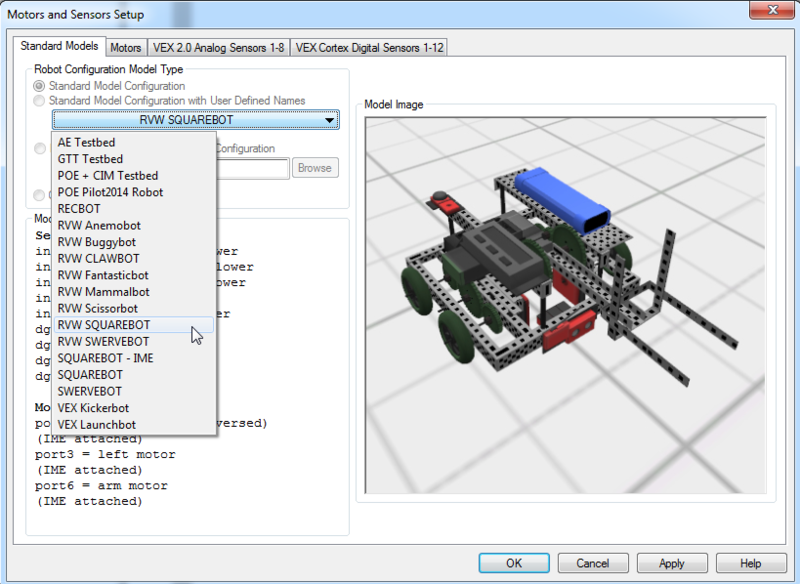 In ROBOTC, we provide you with standard models that will automatically configure your robot to match the virtual robot. They can be found by navigating to the Motors and Sensors set up window in ROBOTC. (Robot -> Motor and Sensors Setup). Once there, under the Standard Models tab, select the "Select Configuration" drop down. As seen in the picture above I have selected the RVW Squarebot. After you select the robot click "apply." This will automatically set up your motors and sensor to work with the Squarebot inside the Virtual World. If you have any questions about this, please let me know. Which robot do you want to change, and what are the changes you want to make. There could be a possible solution that I can point towards. It will be very helpful to have the dimension of the robot in order for the kids to perform proper gear math. While they can easily guess the width of the bot using the 10cm grids of the platform. However, please provide the wheel size, the relative distance from the sensors to the two motors, especially the color sensor. Currently, you can find robot stats on any of the robot menus inside our virtual worlds. We provide the length of the robot, the width of the robot, and the diameters of the robot's wheels. This information can be used to make accurate calculations.